The RE Store (awesome architectural salvage shop that it is) is having its sixth annual Recycled Art & Fashion Show on Friday, April 18th. 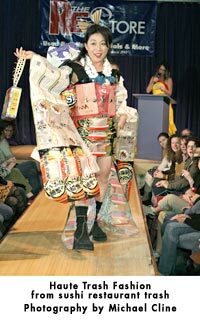 There will be twenty-five Washington-based artists and fashionistas using reclaimed garbage <garbage should be said with a French accent here> to create cutting edge art & couture. 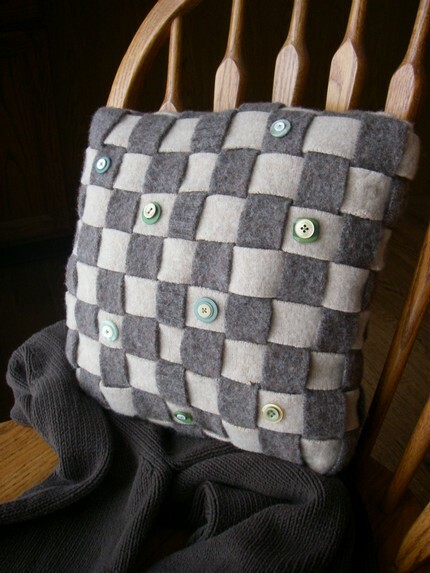 Something I've been seeing quite a bit of late are woven pillows. They're not everywhere or anything, but I've definitely begun noticing them enough to pause and wonder if there's not a trend underfoot. What's more, they're woven pillows usually employing some sort of recycled material. 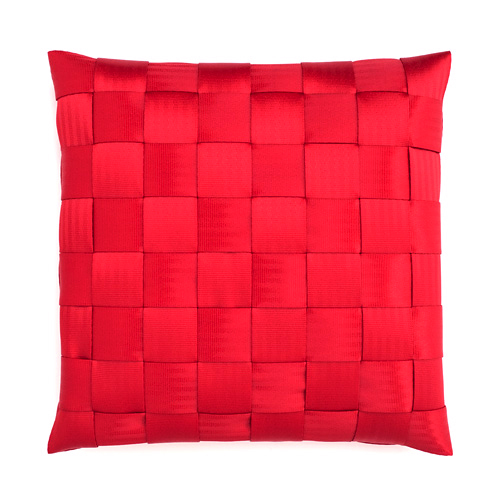 Case in point are the mod reclaimed seat belt pillows handmade in the UK by Ting Studios. Not so good for sleeping on but great look on a sofa. Another woven pillow look that I first saw in the lounge of the fabulous men's store Oslo in Seattle is made from reclaimed neckties (I was relaxing & reading a magazine while M shopped, petting the owner's dog Oslo <yes, the store was named after him> and admiring said pillow, inspecting it to see how I could try to emulate it via thrift store finds). 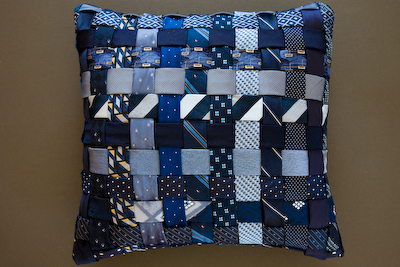 I've since seen similar items elsewhere, and some digging around led me to this example from Ties2Pillows, who not only makes the woven look but uses ties for other pillow styles too. On Etsy, WovenTogether has a chic offering made from reclaimed felted sweaters, embellished with buttons. I'd like to try making one from neckties; I keep forgetting to look for them when I'm thrifting. I took up knitting several years ago when I quit smoking, and taught myself how from a book. I could never master anything beyond the garter stitch, though, and made many, many scarves employing my one and only technique. Well, they eventually turned into scarves. My first attempts were really more of an upper-body wrap, as I made them crazy wide. <ahem> My poor, long-suffering family. Anyway. In an effort to remedy my one-stitch pony repertoire, I've been taking knitting classes at Hilltop Yarn on Seattle's Queen Anne Hill. It's so refreshing to knit something besides a scarf -- using new stitches. I've learned to purl! Let me tell you, I'm excited. Yarn costs a small fortune, though. Its kind of insane. Thus, I've been touring the web looking for deals and came across a great find -- Earth Friendly Yarns. Many of their products are about what you would pay in a regular store around here, but they have organic options, fair trade options, vegan and even recycled options. In addition, they have some really great deals. 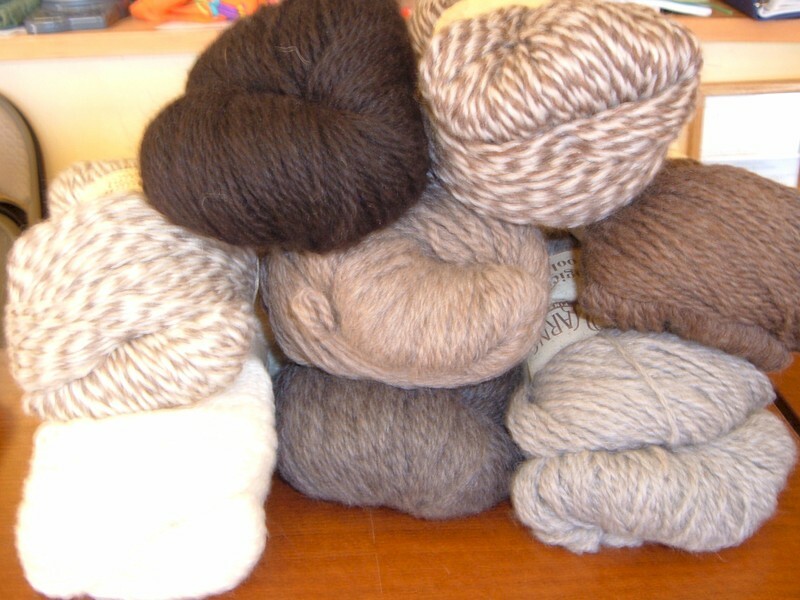 For example, they have undyed, unprocessed Peruvian wool in 478-yard hanks for $15. Yes, you read that correctly. $15 for almost 500 yards! Yowza. The Fiber Gallery in Seattle's Phinney Ridge neighborhood provides these yarns live and in person, or one can order online. I think I'll be swinging by their shop soon and pick myself up some of this bargain basement earth friendly stuff. V.cool. These bits of sturdy paper make great bookmarks. I've often wondered what else they could be re-used for. Maybe as craft paper for kids to make cut-outs with? Pieced together like stained glass with black electrical tape to use as disposable coasters?